As they started running out of manpower, many nations in the Second World War turned to their womenfolk to staff their war machines. In most countries, their roles were limited. They mostly held supporting jobs such as nurses, drivers, and factory workers. 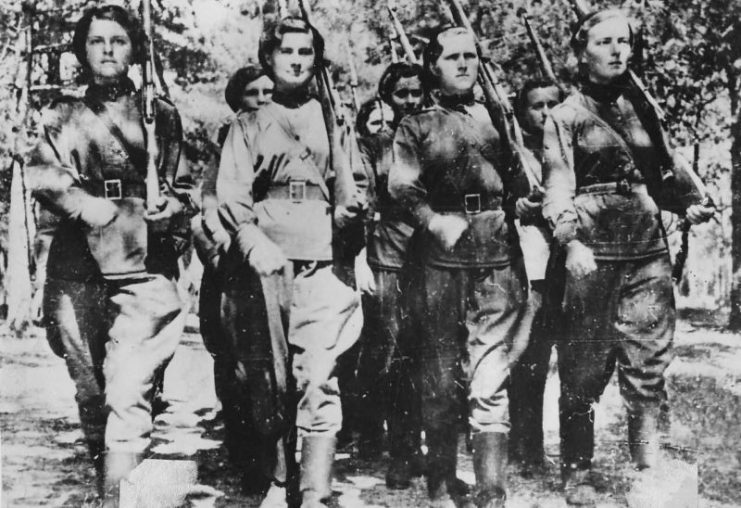 But in the USSR, hundreds of thousands of women served in both front line and supporting roles. Among the most famous combatants were the combat pilots who fought the Germans on the Eastern Front. Some of them had learned to fly before the war as part of flying clubs. They now turned those skills to liberating their homeland from the German invaders. 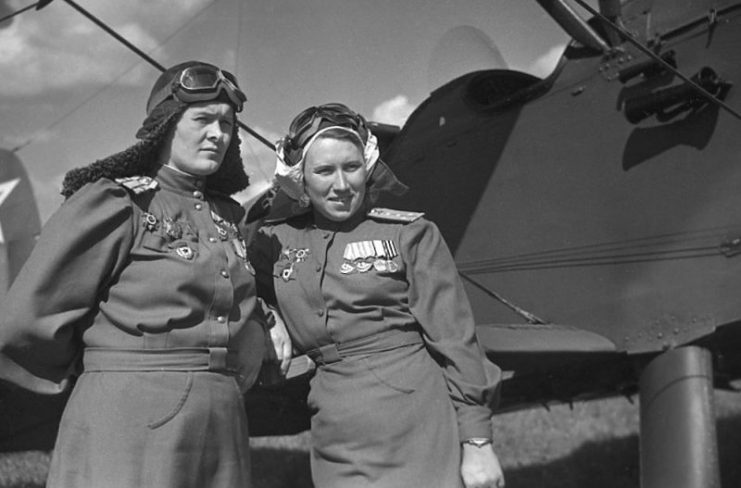 Yevdokia Bershanskaya and Larisa Litvinova in front of a Po-2. 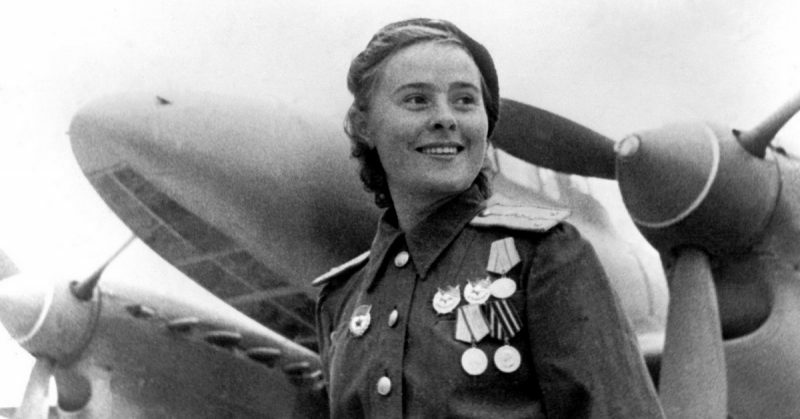 These women often flew Polikarpov Po-2 biplanes, flimsy machines made of plywood and fabric. The only substantial metal component was the engine, and if fire caught hold then the plane would be little more than cinders before it hit the ground. Using bombs and machine guns, these pilots attacked the German ground forces in dangerous low-level missions. 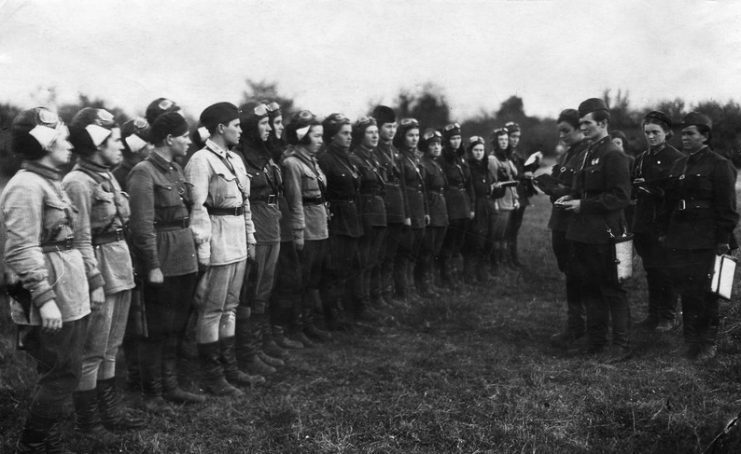 588th Night Bomber Regiment at the airfield in 1942. The other group who gained widespread fame were the snipers. Thousands of women took on this role and most of them did not survive the war. 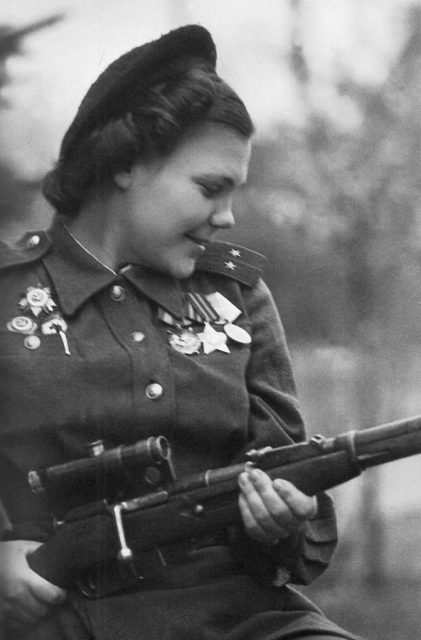 Portrait of Nina Lobkovskaya, a Soviet sniper of WWII. Snipers worked alone or in pairs, finding vantage positions from which they could spy on the enemy lines. Under cover of camouflage, they often waited for hours to take a shot. Their targets were primarily German frontline officers and NCOs, whose deaths could leave their men leaderless and thus ineffective. Soviet snipers also engaged in duels with their German counterparts, stalking each other through ruined cities, and many lost their lives this way. 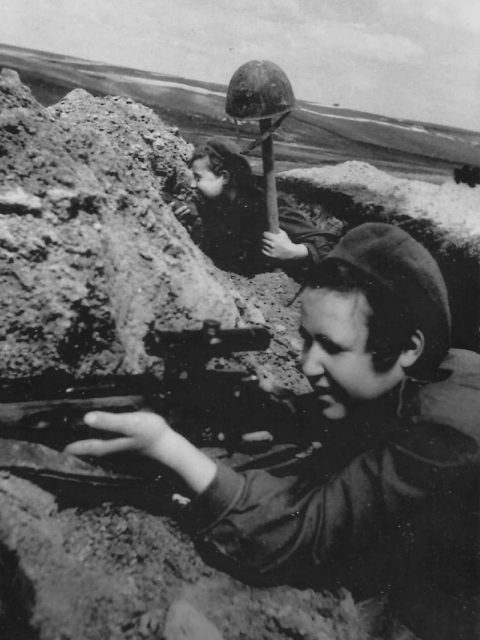 Female snipers of the Soviet 3rd Shock Army/1st Belorussian Front during WWII, May 1945. The partisans were irregular fighters holding out against the Germans in occupied territory. They were more combat-oriented than the resistance movements of other occupied nations, such as France and Czechoslovakia. With the USSR still fighting a war against the Germans, there was more need and more potential for overt action behind enemy lines. The lives of partisans were tough and perilous. They lived in forests and swamps for weeks on end while hiding out from the Germans, suffering from cold and exposure. If they were caught then they would probably be tortured and certainly would be executed as an example to others. The women in these units had to be combatants and caregivers as well. Some of them went into hiding with children or gave birth to them while on the run. They used all their cunning and courage to preserve hope in communities living beneath the Nazi bootheel. Like the partisans, scouts combined skills in fighting and sneaking as they crept through the forests and between the lines, crawling through the mud to covertly survey German positions. As a sergeant major of scouts, Albina Alexandrovna Gantimurova found the experience seared across her mind for the rest of her life. For years afterward, she dreamed of combat every night, waking up to memories of ambushes and jammed guns. Women didn’t just fill the ranks of combat units – sometimes they took command. Liubov Ivanovna Liuchik was one of a group of women who graduated from Ryazan Infantry School as commanders for machine-gun units. 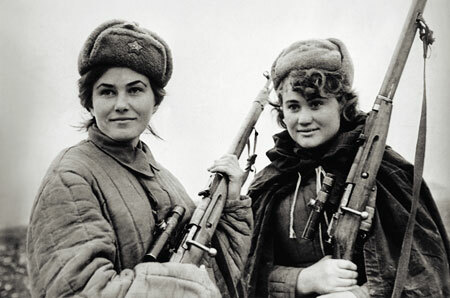 Soviet Army Women with Rifles. She commanded a platoon of machine-gunners, leading and coordinating them. 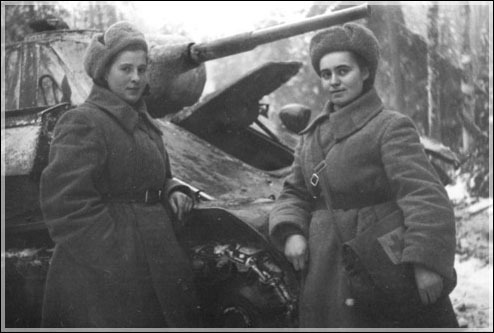 Like them, she carried heavy equipment for miles across Russia, as they held off and then drove back the invaders. For the first time, the Second World War saw the mass bombing of Soviet cities by enemy aircraft. Anti-aircraft gunners played a vital role in defending against this, protecting soldiers, munitions factories, and even civilian homes from attacks that were as much about creating terror as they were about destroying the Soviet war machine. 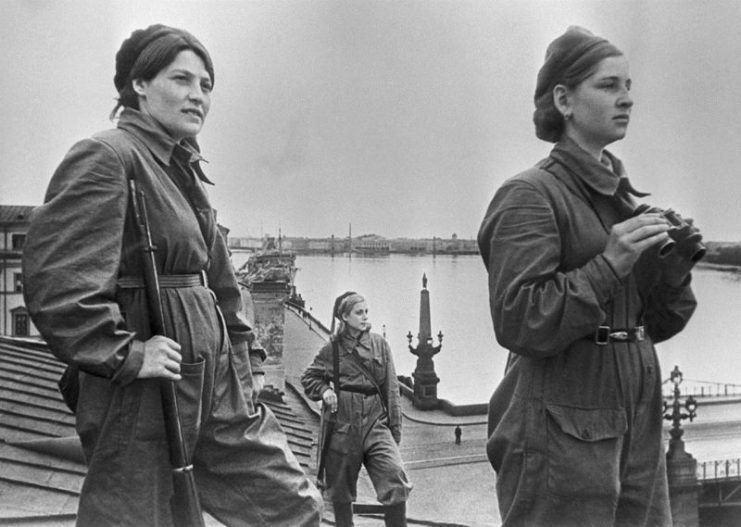 Soviet Soldiers on watch during the Siege of Leningrad. Many women served as nurses and combat medics. Some worked in hospitals and dressing stations, away from the front lines. But others were in the combat zone, risking their lives to drag soldiers out of burning tanks or carry them off battlefields under fire, binding wounds and dispensing medicine in hopes of getting them back for more substantial treatment. 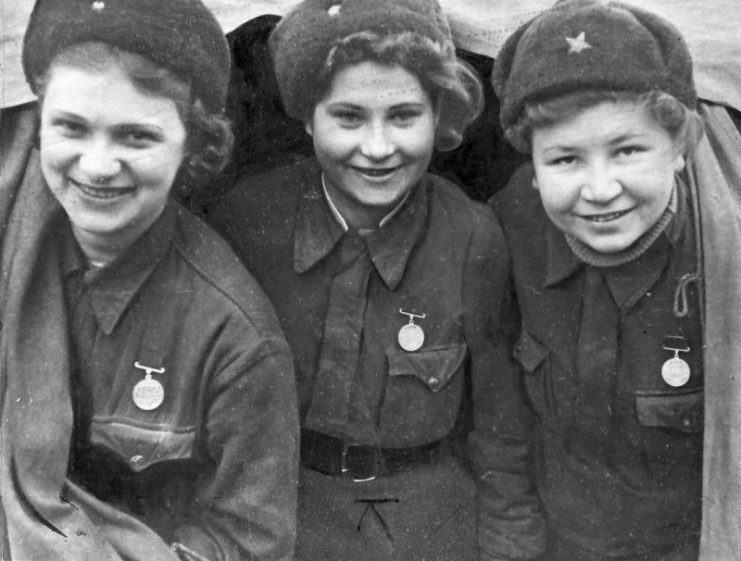 Russina Nurses with Medals – Leningrad 1943. Women worked as doctors as well as nurses. 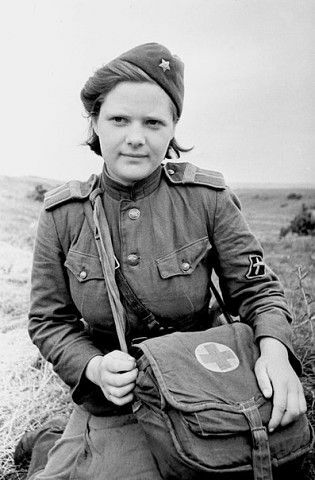 As fully trained professionals, they were higher ranking than other female medics, but still sometimes struggled to assert their authority because of gender expectations. 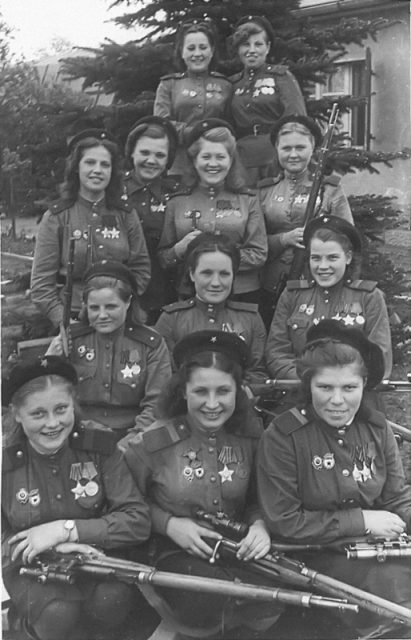 Russian Surgeons with Medals 1944. Though they worked tirelessly to preserve the lives of the men around them, not all could be saved. Captain Efrosinya Grigoryevna Breus was at the front with the same unit as her husband when he was hit by shrapnel and died. Planes, tanks, trucks – all military vehicles experienced heavy wear in the war. Even without the perils of enemy fire, they suffered from malfunctions and breakdowns thanks to the strain put upon them. It took skilled mechanics to keep them in action. Some of these women might have learned mechanical skills before the war, working on family farms. Others learned their trade in military service, acquiring specialist skills such as airplane maintenance. Drivers were essential to the running of the war, transporting men and supplies to, from, and around the combat fronts. Like drivers, traffic controllers were important to maintaining a steady flow of men and supplies for a war that was chewing through them at an unbelievable rate. It wasn’t a glamorous job, and because it wasn’t on the front line, giving it to a woman was less likely to stir up controversy from old-fashioned men. 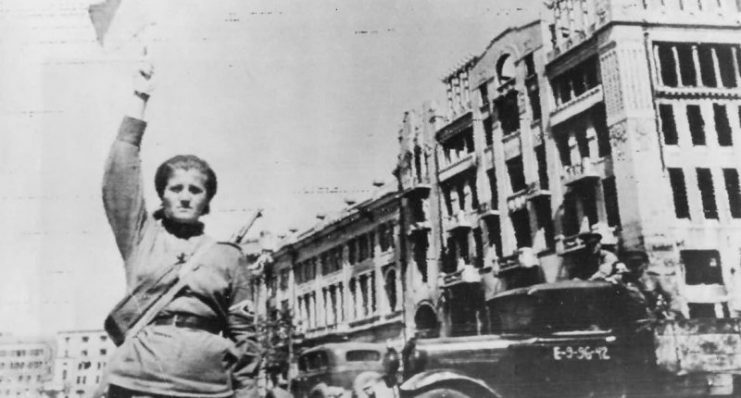 Military Policewoman in Kharkov 1943. Like transport, telecommunications were vital to supporting the fighting front. Sometimes telephone operators kept their stations around the clock, dozing in their seats between calls, their food brought to them by soldiers. 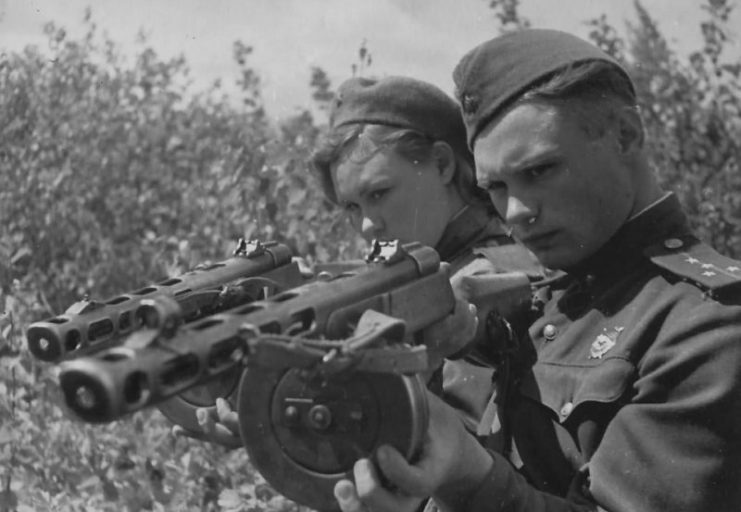 Soviet Soldiers with PPSh-41 Sub-machine guns. 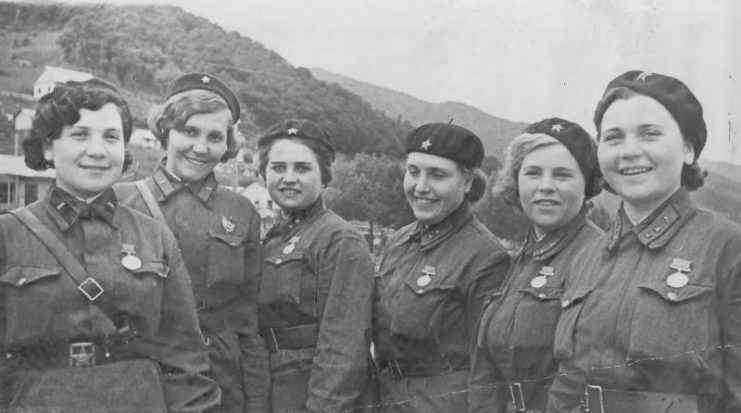 As in the west, women in the USSR were involved in cryptography, encoding and decoding messages so that the Germans could not understand the ones they intercepted. It was work that had to be carried out with care and precision, as a small mistake could turn important information into gibberish. 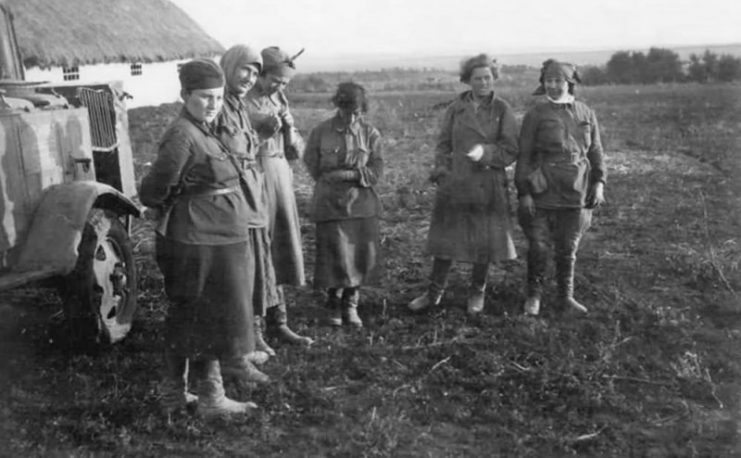 Female Russian POWs captured by the Germans in 1941. Of course, all combat roles and many of those not directly associated with combat had their risks. 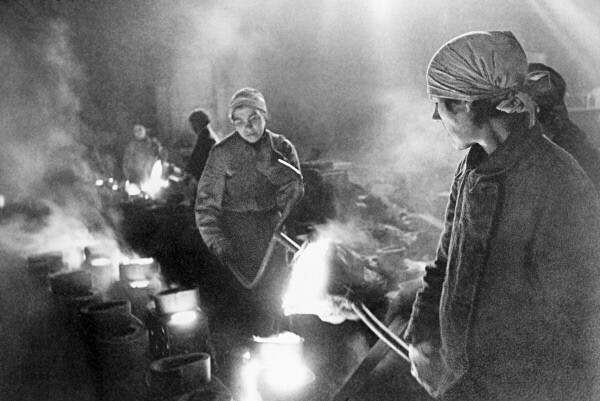 Many Soviet women lost their lives in the line of duty, were wounded or captured. They took their on their roles with all the same responsibilities and dangers as their male counterparts.